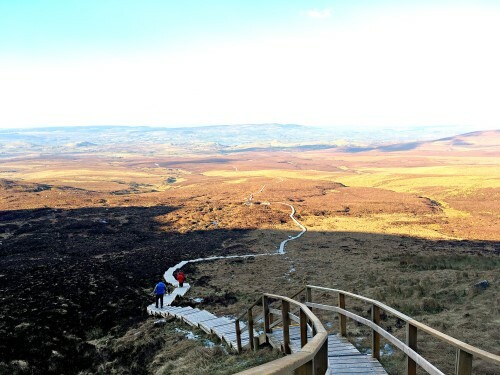 Cuilcagh Mountain Boardwalk in County Fermanagh. 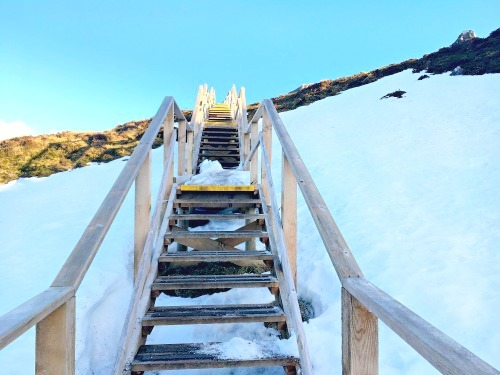 Since it was built in 2015, this popular hike which has featured on many travel Bucket Lists. 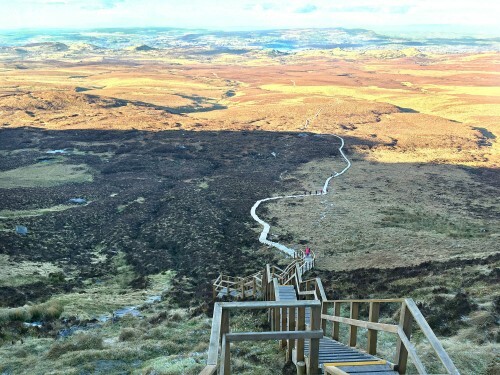 People call it “Ireland’s Stairway to Heaven”. This is where I spent the Saint Patrick’s bank holiday Monday. 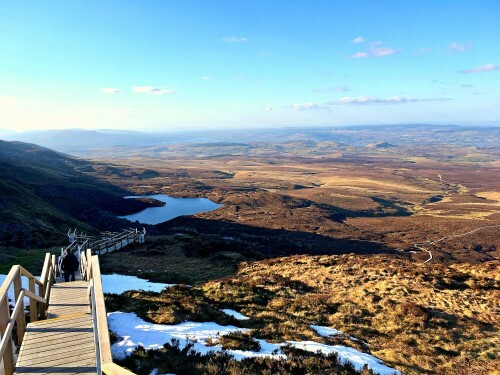 First things first, here’s how you pronounce Cuilcagh Mountain: You simply say Quil-kah or Kul-Kah. You will also sometimes hear locals refer to it as Kul-kee Mountain, but most people use the former two pronunciations. No matter how you say it – It Is Fabulous! Fabulous in a “You can see for miles and miles and not a scrap of concrete in sight” kinda way. And never underestimate the fabulous-ness of walking through an Irish bog with dry feet! From the outside Cuilcagh is rather shy. From the road side, she doesn’t command your attention like other mountains. 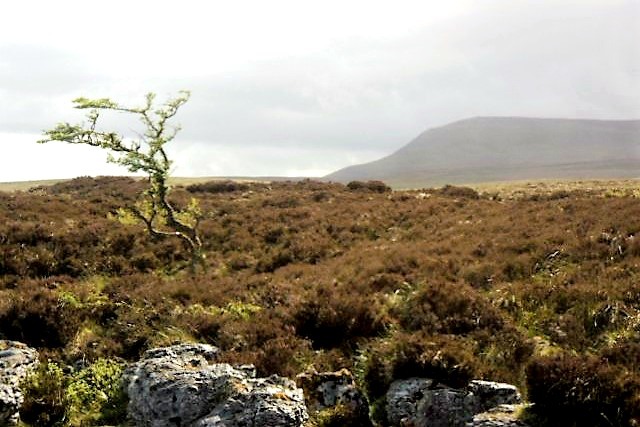 It takes effort to get to know the restrained, flat topped Cuilcagh. A little way along the gravel path you begin to experience the landscape hug. From there on in, she reveals the true extent of her energy and drama – and all your troubles melt away. 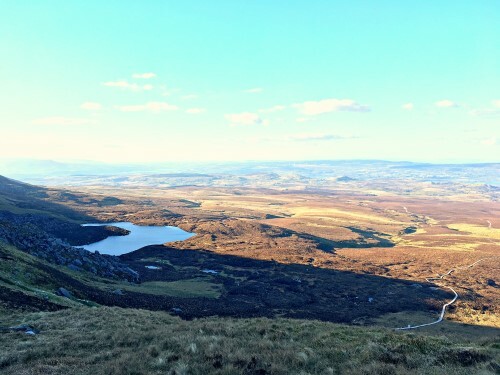 You can see for miles all across Fermanagh and Donegal. Just looking at the soft, muted colours of the bog is calming (even if your legs are aching). 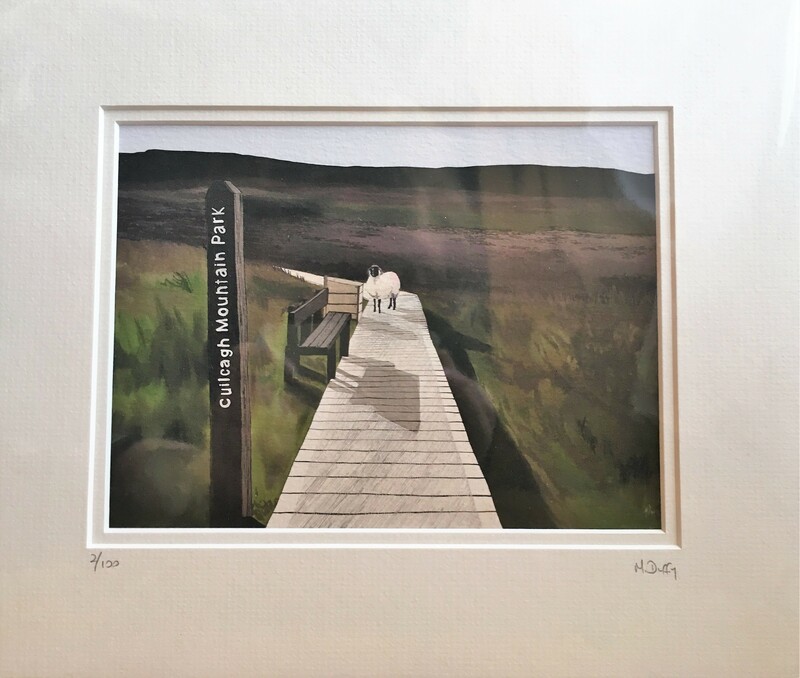 This fine art print by Michelle Duffy captures the natural serenity of Cuilcagh. It was so, so, so cold at the top! I was glad I had crammed my big coat into my backpack. The obligatory selfie at the furthest point. 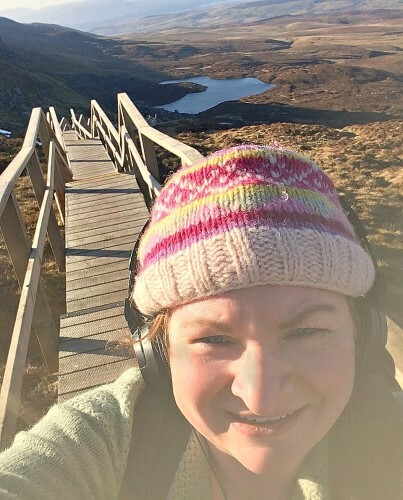 I brought my headphones specifically for some motivation going up all 450 steps (Which had the added bonus of keeping my ears warm). I’m convinced this instrumental version of Run Boy Run got me to the top in half the time. The dramatic music just somehow goes with the scenery and atmosphere on Cuilcagh.